To visit Sardinia, in Italy , is first to discover many beaches and coves, all more beautiful than the others. 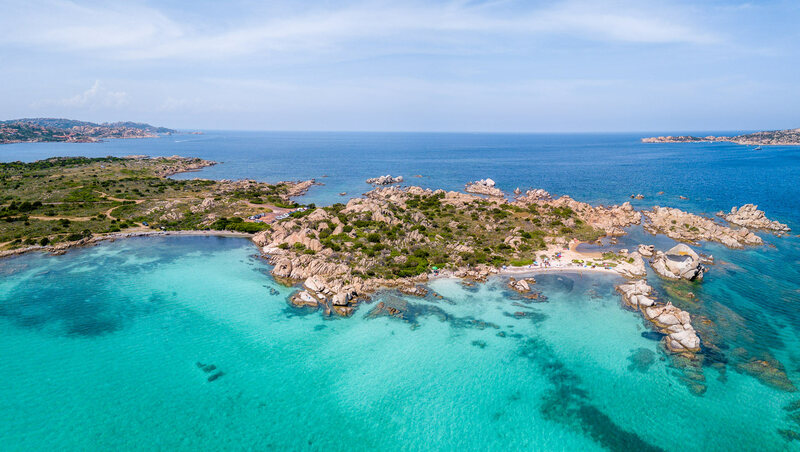 From Cagliari to Costa Smeralda , passing by the island of Sant’Antico , the Costa Paradiso, and the Archipelago of Maddalena , you will find beautiful all along the coast! Large tourist sandy beach with private beaches, small popular cove or lost corner accessible only after a hike, no doubt you will find your happiness in Sardinia. It is the ideal destination in the Mediterranean if you like beautiful beaches! And to alternate with swimming, do not hesitate to take the winding mountain roads to discover other places of interest in Sardinia. The village of Orgosolo, the Su Gorropu Gorges, the numerous caves and nuraghes to visit are all places not to be missed during your trip. To help you organize your stay, I have prepared a guide to 25 things to do and see absolutely in Sardinia. So where to go and what to visit in Sardinia? We start this tourist guide of Sardinia by the most famous city: Cagliari. The modern city is not particularly interesting but its historic center is worth a stroll. If you visit Sardinia, there is a good chance that you will land or leave Cagliari, take the opportunity to take a stroll in the alleys of the old town , at the beginning or at the end of your stay. Poetto Beach: 7 km long, it is one of the largest in Italy and the closest to the center of Cagliari. To continue this list of the most beautiful places of Sardinia , I recommend you to take the panoramic road from Porto Teulada to Chia. Renowned for being one of the most beautiful roads in Sardinia , the SP71 allows you to go along the South-East coast and the seaside with splendid panoramas . The Strada Panoramica della Costa del Sud(another name for the SP71) runs for 25 km through several coves and beaches with translucent water. There are so many that the hard part will be to choose which one you prefer to swim! The Torre di Pixinni and its cove of small pebbles and pebbles: one of my favorites of all my itinerary in Sardinia, we were there alone! Cala Cipolla: a beach with big rocks and transparent water. This is my favorite beach on the Strada Panoramica! The lighthouse of Capo Spartivento, accessible by a path from Cala Cipolla. It allows to admire a magnificent panorama on all the coast. If you are wondering what to see absolutely in the South of Sardinia, I advise you to go to the island of Sant Antioco. After Sicily , Sardinia and the island of Elba, it is the fourth largest island in Italy. No need to take a ferry to reach it, a bridge connects to the mainland. 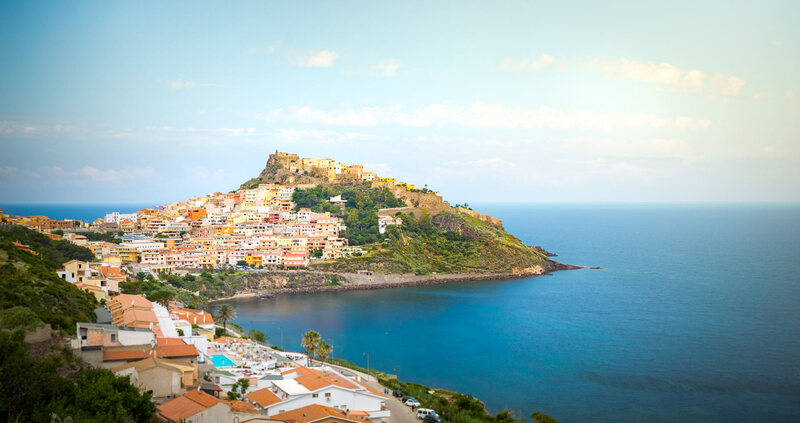 The town of Sant Antioco: the main town of the island where you can walk along the harbor and the seaside; visit the Basilica di Sant Antioco, the archaeological museum, the Forte Su Pisu and the Villagio Ipogeo, a group of troglodyte houses. Cala Lunga: the most beautiful beach of Sant Antioco! Clear water, fine sand and little depth. To enjoy a nice view of the Cala Lunga , take a little height by taking the path that goes up to the left of the beach. Neighboring Sant Antioco Island, San Pietro definitely deserves to be listed on the list of things to see in Sardinia. La Spiaggia La Bobba: one of the most popular beaches of San Pietro. There is ample parking, a bar and can rent kayaks. Do not hesitate to walk on the path to the right to see the “Column”, very photogenic rocks. Capo Sandalo, without a doubt the most beautiful place on the island! It offers panoramic views of both sides and cliffs below. You can reach San Pietro from Sant Antioco by taking the ferry from Calasseta to Carlorforte. There are about every hour. The trip takes 1/2 hour and costs about 35 € for 2 + the car (round trip). Be off the ferry a little early so you have time to buy your tickets. The nuraghes are among the places of interest to see in Sardinia. 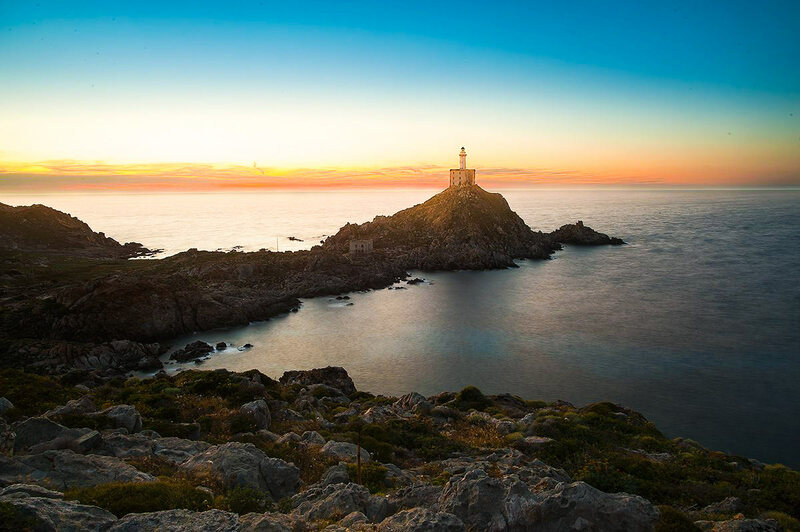 As there are scattered throughout the island, you will have no trouble to visit at least one during your trip to Sardinia. But first of all do you know what a nuraghe is? Having never heard of it before going to Sardinia, I give you a little definition. The nuraghes are stone towers whose origin dates back to the Bronze Age and Nuragic civilization . 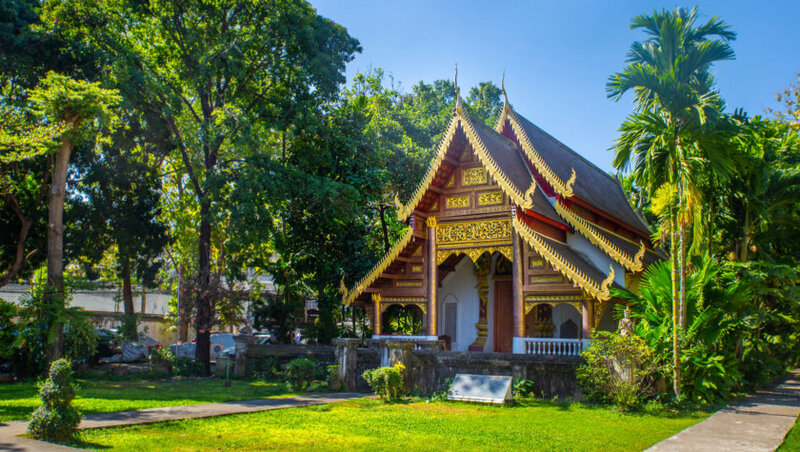 Their function is not exactly determined but several studies agree that they served as watchtowers and also as sacred sites for certain religious rites. Basically, some of them turned into real complexes thanks to ramparts connecting them to each other. 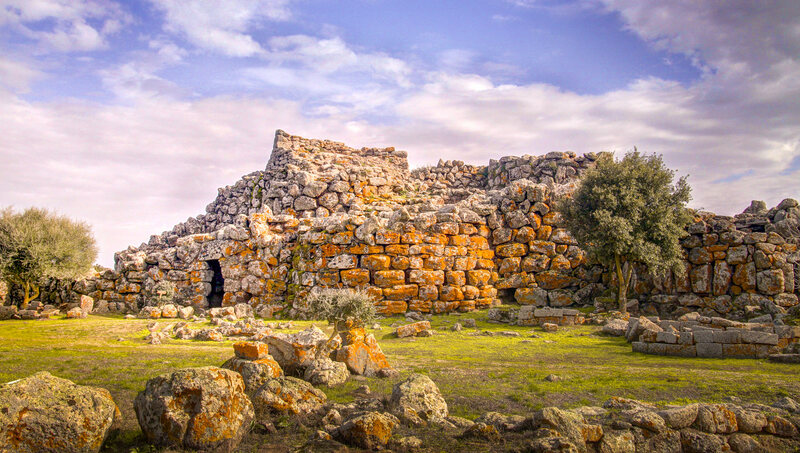 The best known and visited in Sardinia is the Nuraghe Su Nuraxi . Large nuragic complex located in Barumini , this is the only Sardinian site to be listed as a UNESCO World Heritage Site. It consists of a central tower to which was added a bastion, 4 towers, a courtyard and a well. Over time, the nuraghe was reinforced with ramparts, other towers and a small nuragic village of about 50 houses was built all around. The tours are guided only. Other nuraghi worth visiting are Nuraghe Arrubiu, Nuraghe di Palmavera or Santu Antine. Among the places to visit in Sardinia, go to the coast of Iglesiente. The coast road SP 83, along the Iglesiente, is known for offering spectacular views of the sea and the mountains. It also happens in the mining villages , which made the reputation of this part of Sardinia. The region was home to the main mineral wealth of the island, such as lead or silver. Today this mountainous region is characterized by unspoiled and wild landscapes. Nebida and its belvedere on the sugar loaf or Pan di Zucchero. Pan di Zucchero so nicknamed because of its resemblance to the one in Rio, Brazil. It is one of the largest faraglioni of Sardinia, it is 133 meters high. The mine Porto Flavia where he had dug the cliff almost 600 meters to allow the transport of minerals. Guided visit only and by reservation at the tourist office of Iglesias. 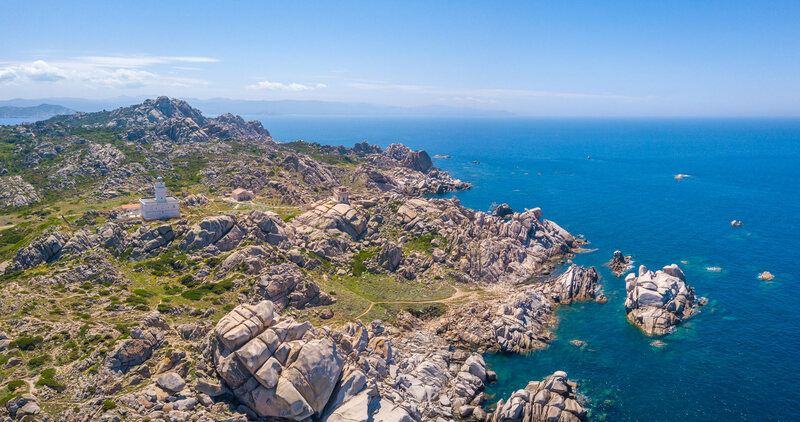 Let’s continue to do some sightseeing in Sardinia by going to the Sinis Peninsula. This area is located in the center-west of Sardinia, near the Gulf of Oristano . It includes several beachesconsidered as the most beautiful in Sardinia including that of Is Aruttas or Putzu Idu. The peninsula is also home to one of the most important archaeological sites on the island: the archaeological area of ​​Tharros. A former trading post founded by the Phoenicians, Tharros soon became an important trading venue thanks to its strategic location. Totally abandoned in 1070, only ruins remain today. The site is open every day and the entrance costs 5 €. Just after Tharros, you can take a nice walk to Capo San Marco . Feel free to climb to the San Giovanni Tower to enjoy a panorama of the archaeological site and also the surrounding beaches. The view is really beautiful. Continuation of our Top Things to do and see in Sardinia by the city of Oristano, west of the island. Oristano is a very pleasant city where it is good to walk an hour, to discover the historic center. It’s small but very cute and you’ll find plenty of cafes and restaurants as well as a shopping street for some shopping. 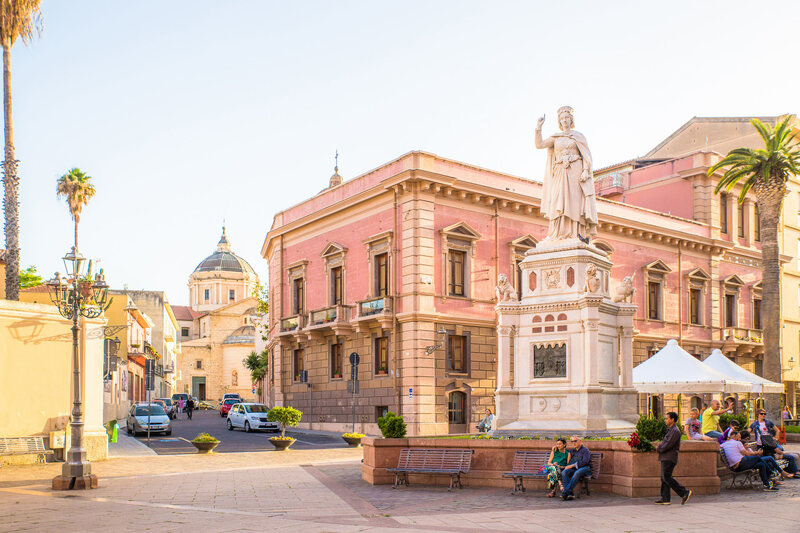 Then go to Piazza Eleonora d’Arborea. It pays homage to the judge of Oristano who wrote the Carta de Logu, known for being one of the first civil codes of Europe. Finish by Piazza Roma where is the Torre di Mariano II (or Torre di San Cristoforo), one of the 2 remaining towers of the walls of this ancient medieval city. Do not leave Oristano without having tasted an ice cream from Barbagelato , located in Piazza Roma. We will not go by 4 ways it’s the best ice cream I’ve eaten in Sardinia, or even in my life! They are just delicious. Special mention for Veleno and Dolce Latte! 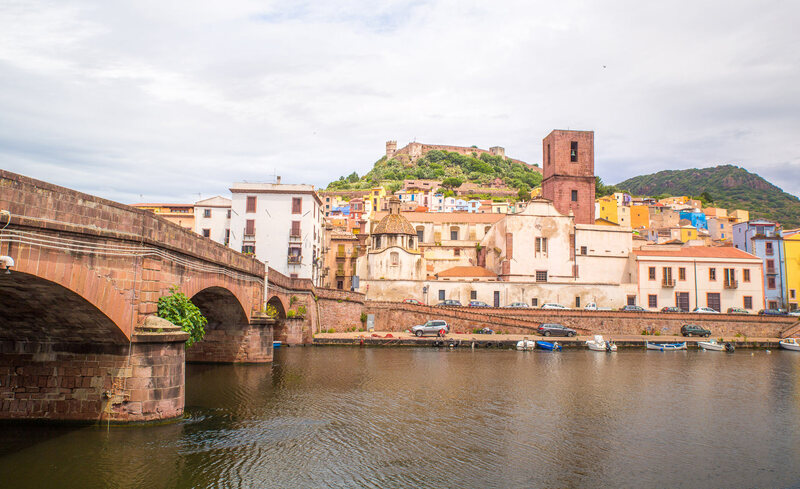 Not to be missed in Sardinia: the pretty town of Bosa. Bosa is a cute little town with colorful houses with pastel facades and located on the banks of the river. Dominated by the castle at the top of the hill, it is for me one of the most beautiful villages of Sardinia . The best viewpoint to admire it is on the road just before arriving. Castle Serravalle or Malaspina: overlooking the city, do not hesitate to climb the stairs that lead to contemplate the view between sea and mountains. 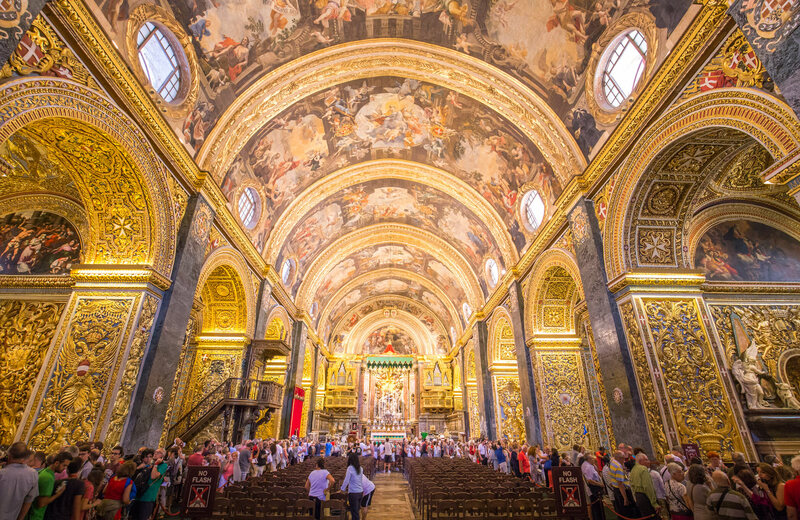 You can visit the interior, especially known for its chapel and its old frescoes. A few kilometers from Bosa you will find the seaside resort of Bosa Marina . I did not find the beach particularly beautiful so if you want to combine the visit of Bosa with a bathing break, I recommend the beaches north of Bosa such as that of Compultittu or S’abba Drucche beach. 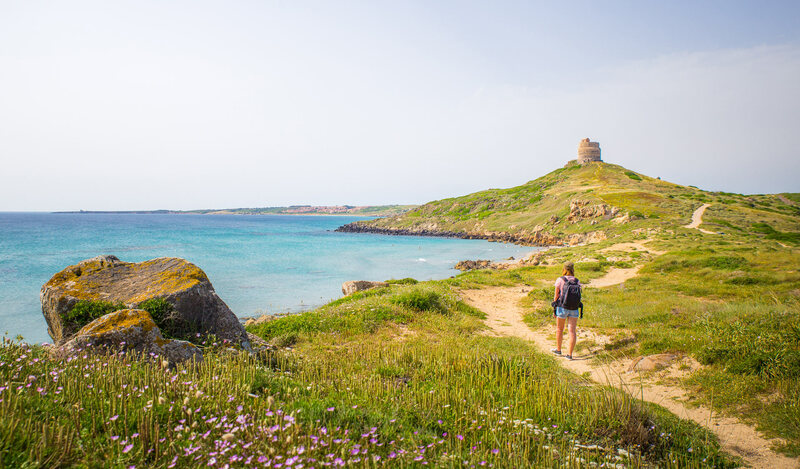 The island of Asinara is one of the great classics of a stay in Sardinia. It is located at the northwestern tip of the island. It has a special story because since the First World War and until 1998, it was used to accommodate prisoners (war and even the mafia!). Following the discovery of many species of plants living only on the island, it was decided to turn it into a national park and the prisons were closed. Today, access to the island of Asinara is forbidden to cars , except for those of tourist excursions, of course. To visit it, you will have to take the boat to Stintino . The journey takes about 1/2 hour and there is often only one leaving around 9am in the morning, reservations are required. To discover the island, you will have the choice between a guided tour by jeep, a tour by small train or the rent of bicycles, the only way to visit the island independently. Everything is often complete, remember to book in advance. In all cases, the schedules are strict , you will have to respect the schedules of the boat on the arrival and the departure. On the island you will visit the prison, have a picnic on the best known cove and watch the famous albino and dwarf donkeys of Asinara. There will not necessarily be a bathing break, most beaches are forbidden to swim as protected. We continue this guide of Sardinia by taking an interest in Alghero. Located on the northwest coast, the city is famous for its historic center with its cobbled streets and where all the monuments to see. It’s cute, well laid out and you have to admit it very touristy. There are souvenir shops, restaurants and cafes everywhere. You will also find many shops selling coral jewelry , the specialty of the region. So what to do in Alghero, Sardinia? Park your car on one of the car parks along the sea, before reaching the historic center. Tourist site of a stay in Sardinia: the caves of Neptune. By boat from Alghero. The boat drops you at the entrance and awaits you at the exit. Remember to book in advance. By boat from a pier in Porto Conte, the village before arriving at the caves. Walk ! For this you have to go down 654 steps cut into the cliff and it’s quite impressive. Remember that afterwards it will be necessary to remount them! This is the most tiring method but it is still the way to be sure to visit the caves of Neptune. In case of a rough sea, the boats can not land the passengers at the entrance and are therefore forced to turn around. The caves are 4 km long but only part of it is accessible to visitors. You will be able to observe many stalactites and stalagmites as well as an interior lake. 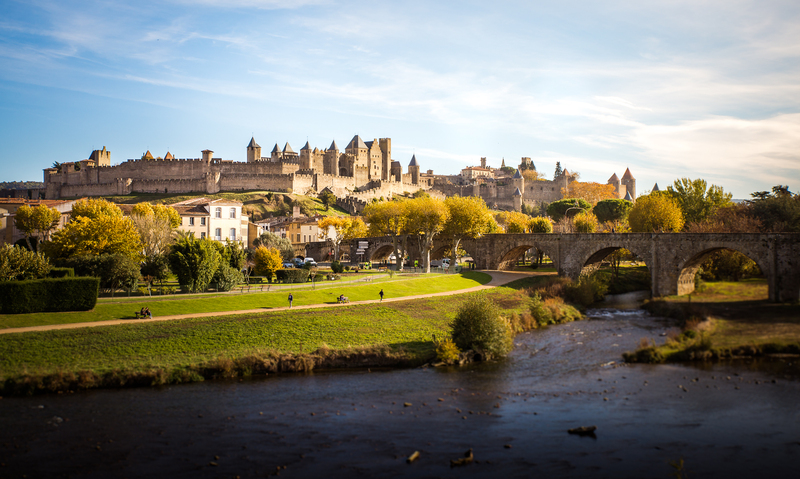 The tours are guided and depart every hour from 9h to 19h . If you come to the cave at 9:10 am, you will have to wait until 10am. Allow about 45 minutes of visit for 13 € per person / 7 € per child. If you do not want to take a guided tour of the caves because you find it too expensive or too crowded, I suggest you walk down there . Arrived at the bottom, you will be able nevertheless to have a preview of one of the rooms of the cave to make some photos memories before the ascent! If you do not know what to see in Sardinia, I suggest you visit Castelsardo. This pretty medieval village is located in Northern Sardinia, in the province of Sassari. Who says medieval village says castle and ramparts , and Castelsardo does not derogate from the rule. 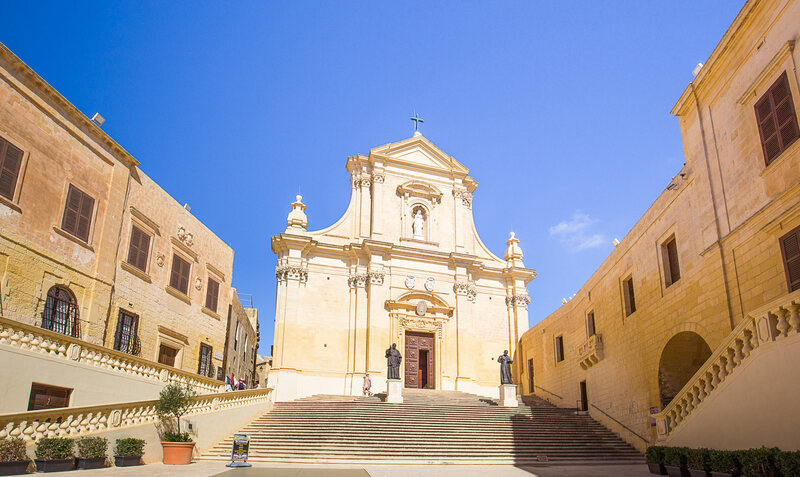 Guests can enjoy a pleasant stroll through the village to discover the cathedral and the campanile of the Chiesa di Santa Maria and the castle . The interior houses a museum dedicated to the art that makes the reputation of the city: basketry. You can also observe some nice grannies still practicing in the streets and will be happy to give you a demonstration. Castelsardo is a must for tourist coaches, you will find classic souvenir and craft shops as well as lots of bars and restaurants . Allow about 1 to 2 hours of visit. From Castelsardo, do not miss the Roccia dell’elefante , a rock whose shape evokes an elephant with a raised horn. Inside there are 2 Neolithic tombs. Photo stop compulsory! Beautiful coastline bordered by sublime coves, the Costa Paradiso is a must to integrate in your holidays in Sardinia. Do not be surprised, to reach the coast and the village , you will have to go through a road at the entrance of which is a barrier and normally a guard. I say normally because during our passage the barrier was raised and no guard on the horizon. The road then descends to the sea through many small cottages more or less hidden in the greenery. 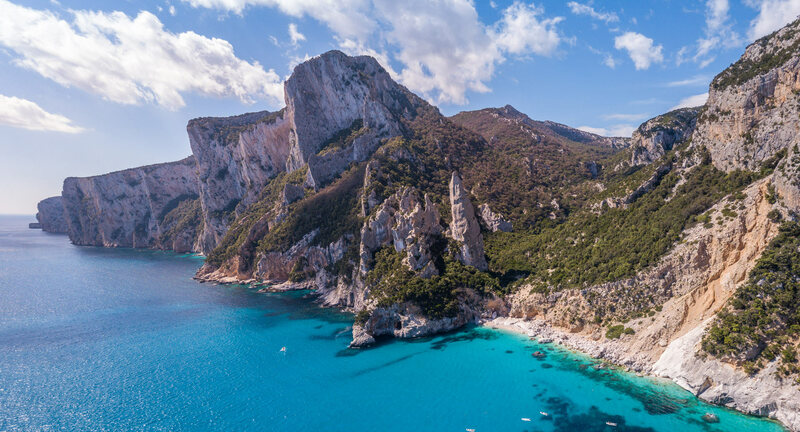 Even if the result is relatively harmonious, you will soon realize that you arrive in the very touristy part of Sardinia with big holiday complexes and the prices that come with it. In short, it’s the Côte d’Azur version of Sardinia! The most famous cove of the Costa Paradiso is that of Li Cossi. It is accessible by a beautiful trail with no difficulty in about 10 minutes walk from the parking. The cove is pretty but quite small , so there is always a lot of people, which is logical given the number of houses in the area! There is a bar that also rents paddle boats and kayaks . This is also an activity that I recommend you do here because with the rocks of pink granite and turquoise water, the landscapes are superb. I present here one of my big favorites of my holidays in Sardinia, the Capo Testa. Formerly used by Romans as a granite quarry, the Capo Testa is an expanse of gigantic rocks with improbable forms carved by erosion. Located at the edge of the water, the place is really beautiful. You can walk there at your own pace and do dozens of pictures of rocks! Cala Spinosa, turquoise water and pretty rocks! The island of Maddalena is a must on a circuit in Sardinia. It is part of the Maddalena Archipelago National Park comprising 7 islands in all. With La Caprera (I’ll talk about it below), the Maddalena is the only one accessible by car. The other islands can only be visited by boat. To access the Maddalena, ferry departures are from Palau. It takes about 20 minutes and € 40 for a 2-person round trip and a car. Several companies make the trip every day. Here, we come mostly to enjoy the beaches, there is no big city and specific villages to visit. I advise you to rent a car to follow the scenic route and stop swimming when you feel like it. Bassa Trinita: white sand and clear water at the rendezvous. But she is also well known, so there are a lot of people. The Spiaggia del Cardellino: much quieter because located just after Monte di Rena. A nice place to swim in Sardinia. The beach Testa del Polpo or Capocchia Purpu, literally “head of the octopus”. To see absolutely, it is for me the most beautiful beach of Maddalena. Turquoise water and shallow, big rocks, it’s like the Seychelles! If you also want to visit the other islands of the archipelago accessible only by boat like Budelli or Spargi , I recommend you to book your excursion now . For a whole day, you will go around the islands with swimming or visit stops and enjoy a lunch on board. From 40 € only per person. When traveling by boat from Palau, you can see in the distance and on your right, the famous Roccia del Orso , a bear-shaped rock. The place is visited but the parking and the entrance being paid, I find it a little abused to go see a simple rock. From the boat, the view is impressive, take the opportunity to take a picture! Caprera is also included in the Maddalena Archipelago. To join it, nothing more simple you just take the bridge that connects to the island of Maddalena, its neighbor. The secluded beaches of Cala Brigantina and Cala Coticcio. Requires some walking to reach them. After swimming, you can go to the lookout tower Teialone. A staircase can climb to the highest point of the island, 212 meters high. 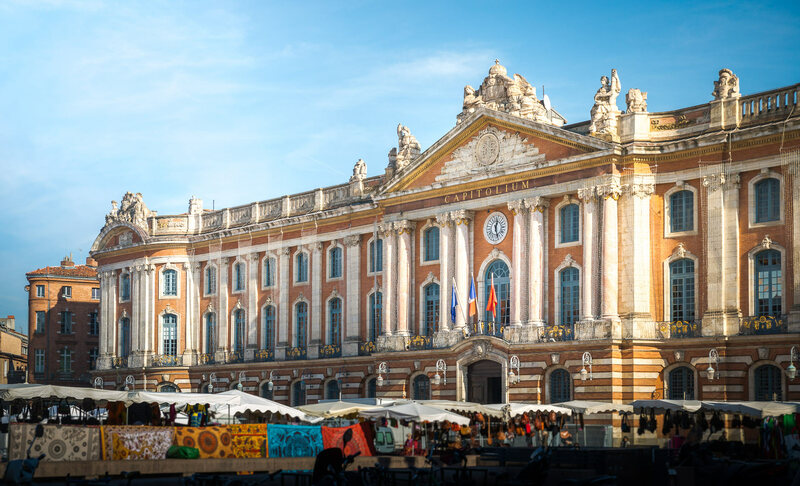 And of course do not miss to go to the house of Giuseppe Garibaldi, Compendio Garibaldino. You may not know it, but the Italian patriot bought the island and made it his home after he ended his career. 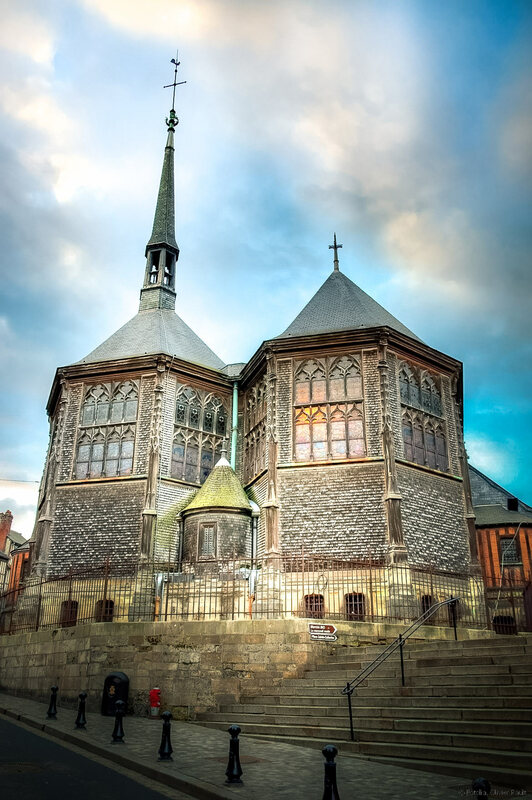 Today you can discover his house during a guided tour. To finish in style your tour of Caprera, I recommend you to go to the abandoned fort di Poggi Rasu Superiore. The place offers the most beautiful point of view on the whole island and the surroundings. You may even see wild goats there. For your lunch on the Caprera, I recommend the “I Mille” . This kiosk is located in a very nice setting, with plenty of shadows, tables and hammocks. And in addition their sandwiches are just delicious and very hearty based on good charcuterie and local cheeses! 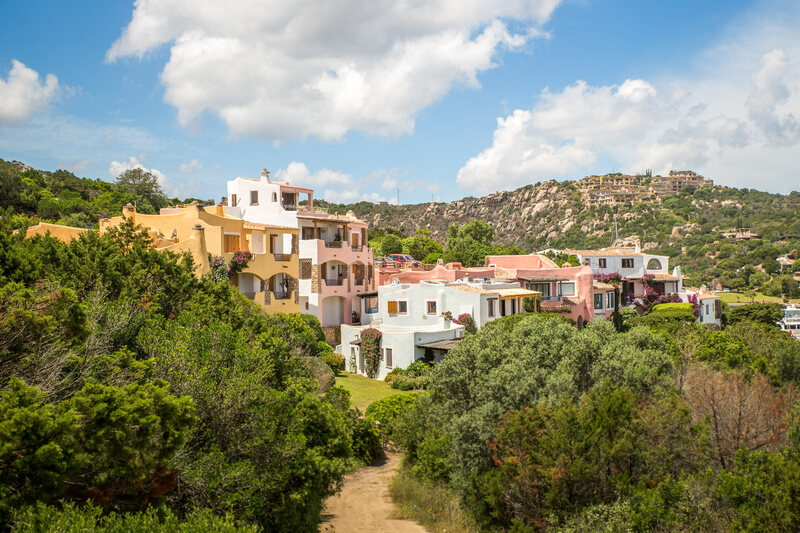 Highly regarded destination in Sardinia for its jet set and bling bling side, Costa Smeralda. Frequented by billionaires and their yacht, we come here to be seen. The proof, the port of Porto Cervo,the “capital” of the Costa Smeralda is filled with luxurious boats . You will also find streets with luxury shopswhere to find the latest fashionable bag. And big celebrities like Harrison Ford or Sting have huge villas there. And we do not break the rule with the beaches located around Porto Cervo . The car parks are all paying, and most are mostly private with sunbeds everywhere . Despite this, some are really beautiful. The beach Liscia Ruja: the upscale version of the private beach, well appointed. It was the Aga Khan who in 1962 decided to buy the lands of this part of Sardinia and to create the Costa Smeralda consortium . Its goal is to transform the region into a renowned resort . I think he did it! Visiting Sardinia is also discovering beautiful mountain villages and Orgosolo is definitely part of it. Orgosolo’s reputation comes from its “murals” , paintings and frescoes painted directly on the facades of houses . The majority want to convey a political message or refer to major international events such as the World Trade Center bombings. There are more than 200 in Orgosolo. Most are along Corso Repubblica and adjacent streets. 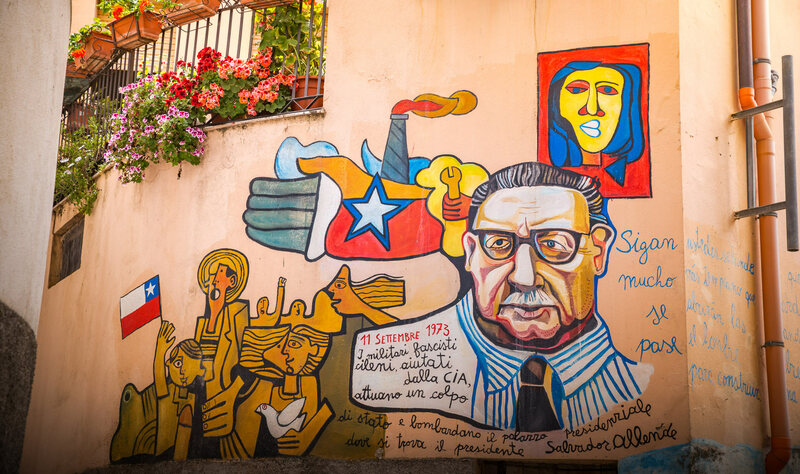 If you want to discover the stories behind the murals, I advise you to rent an audioguide provided with a card (5 € / person) or only a 3 € card if the explanations do not interest you. You can also walk randomly in the streets, it’s free! The place is quite busy and you will find many shops selling representations of murals in all forms: mouse pad, coasters, tee-shirt and more amazing still, postcards! The main tourist activity of the Gulf of Orosei, it is the cruises which takes you to discover the creeks only accessible by boat. All departures are from Cala Gonone , a small seaside town. You will be spoiled for choice to choose your provider, there are several shops in the city center and they all have a hut on the port, where the boats leave. Overall, they offer exactly the same thing and the prices are the same. But the activity is strongly requested, I advise you to book your excursion at least a day before. A sailboat cruise of one day, about 90 € per person. This includes lunch and bathing stops. A zodiac cruise with driver and stops on some creeks, about 40 € per person. Departure around 9.30am and return at 5.30pm. Rent a zodiac that you can drive yourself without a boat license. Count about 120 € for the boat and gasoline. We chose this option because we are not fans of imposed schedules and prefer to go at our own pace. And in the end, if you are at least 4 people, it’s even cheaper than an organized tour! In addition, it’s great to be able to drive the boat and really not complicated. 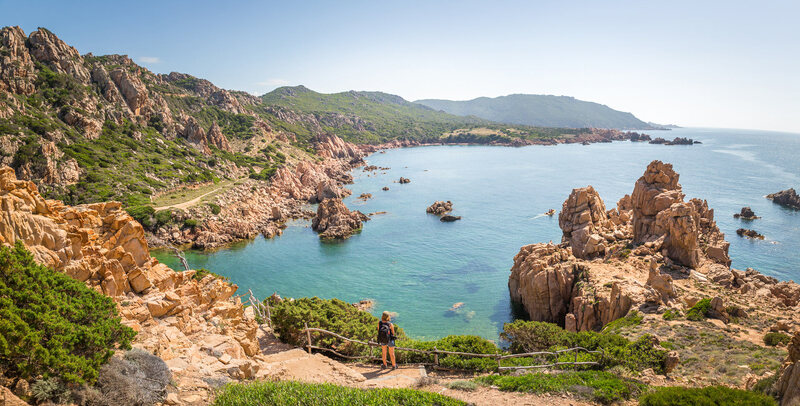 It is an excursion to do absolutely in Sardinia! The Bue Marino Grottoes are one of the major attractions of this part of Sardinia. This name was given to them because the caves were the last refuge of the monk seal , also nicknamed “marine beef”, “bue marino” in Italian. They are located in the Gulf of Orosei, in the same place as the creeks. To access it, it is by boat that it happens! And departures are also from Cala Gonone. 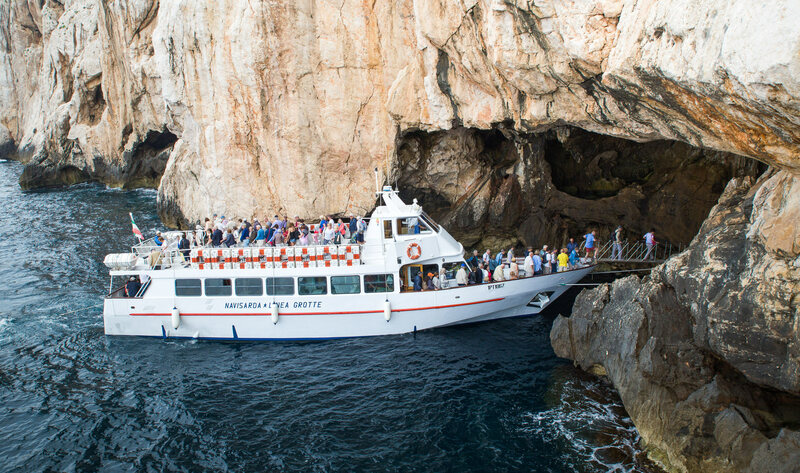 Several types of formulas are planned to visit the caves: a boat trip for the day with discovery of the creeks and the cave (40 € + 9 € for the entry of the cave) or just a transfer by boat back and forth to the cave (about 25 € counting the entrance). Some providers also combine a cave tour with a swim break on Cala Luna. You choose according to the time you want to spend on the spot. Guided visits only take place every hour and last approximately 1 hour. 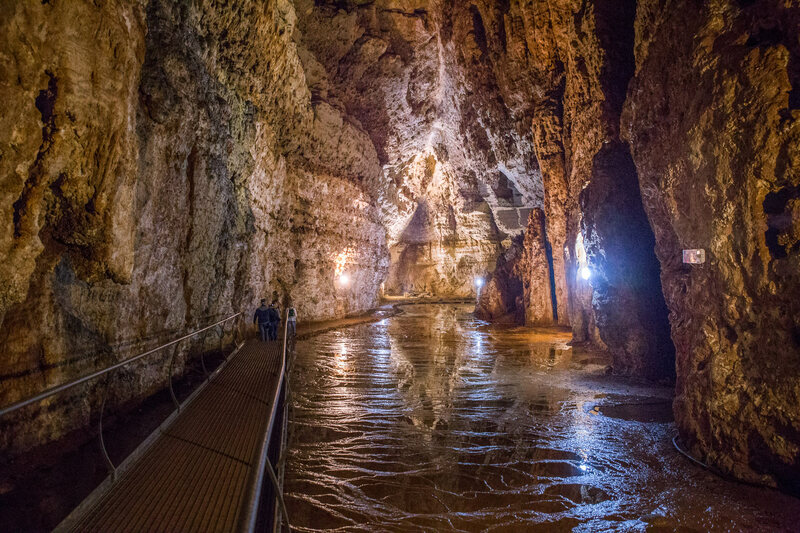 You will be able to discover a magnificent and huge limestone cave by visiting in particular the candelabra room and the room of the mirrors. If you are looking for Sardinia for hiking , I recommend you go to Su Gorropu Gorge . It is one of the most beautiful corners of Sardinia to practice this activity. The Gorges are indeed famous for being the deepest in Sardinia and even in Europe. The Gorges are located near the Gulf of Orosei and can be reached by the road linking Dorgali to Arbatax. By the way, this panoramic road (the SS 125) allows to take advantage of superb panorama on the mountains. Several starting points are possible to hike to Su Gorropu and join the Gorges. One part of the parking located towards the Hotel Silana, Km 183 of the SS 125; the other is Sa Barva Bridge, 15 km from Dorgali. In all cases, count at least between 4 and 5 hours of walking . Arrived at the edge of the throats, you will have to pay 5 € to the hut to be able to enter . From here you can walk and discover the canyon and its huge limestone cliffs. The last part of the canyon (the red route) is only allowed with a guide. Plan on good shoes and lots of water. For the lift, if you are too tired, Jeep waiting for you and make the trip to the parking lot. The price is about fifteen euros. Note that to reach the Jeep, you still have to walk about 1 hour. Where to go in Sardinia to see beautiful beaches? Easy answer: everywhere! And yes in Sardinia, at any time of the day, you can decide to go for a swim and for that you do not need to drive hours in search of the perfect beach. Small coves isolated from the worldand accessible only on foot to the large sandy beaches with sunbed rental, there is something for everyone. Of course there are hundreds of other beaches in Sardinia so it’s impossible to list them all here, but I’ll be preparing for you soon a full article on the most beautiful in Sardinia! In Sardinia, it is not the beautiful beaches that are missing! What to do in Sardinia to change a bit of sunbathing and swimming and especially to enjoy a little cool? You can go to visit caves! And that’s because besides the sea ​​caves of Neptune and Bue Marino , there are several terrestrial caves worth visiting in Sardinia. 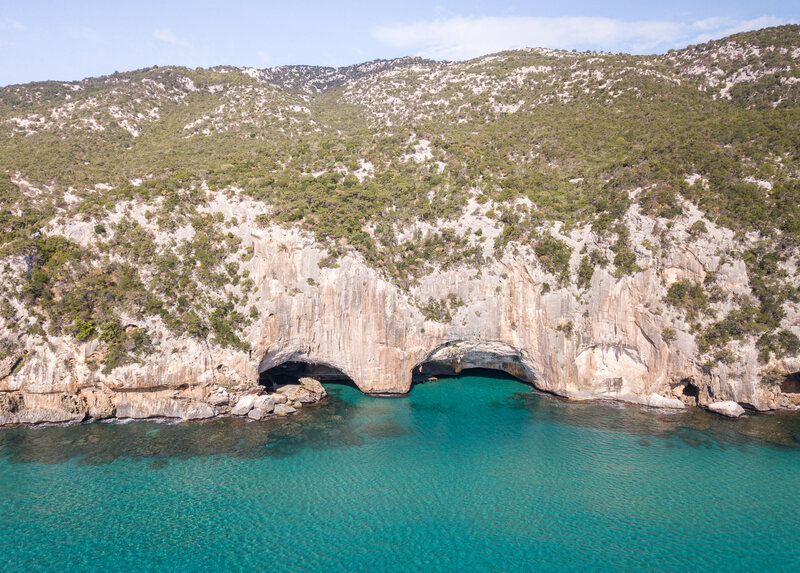 Which caves to visit in Sardinia? The cave of Su Marmuri: located around Ulassai and Tortoli. Long of 1 km and with a height of 50 meters by place, it is one of the most impressive of Sardinia. During the visit of approximately 1 hour, you will be able to admire numerous concretions with very surprising forms. The tour is very interesting and the guide speaks French very well, which is a real plus! The cave of Ispinigoli: located towards Dorgali and the Gulf of Oroseil. You have to go there if only to see the giant stalagmite 38 meters high! Guided tour of about 45 minutes. Is Zuddas cave: located 6 km from Santadi. Beautiful cave with beautiful crystals in the last room. Count 1 hour for the guided tour. Some guides speak French otherwise a sheet with explanations in French is provided. Grotta di Su Mannau: near Fluminimaggiore. You will be able to see several lakes during the visit of 1 hour. The Grotta di San Giovanni: 4 km from Domusnovas. Small cave of stalactites and stalagmites whose entry is free! Visiting Sardinia and not eating at least once in an agriturismo (farm-inn) is unthinkable. This type of establishment is indeed the best place to taste true Sardinian cuisine! Antispati: a cheese and sausage platter + vegetables cooked and marinated like eggplants or artichokes. A primo piatto: usually a pasta dish. The Sardinian specialty is gnocchetti, shell-shaped pasta and culurgiones, sort of ravioli stuffed with cheese and served with tomato sauce. A secondo piatto: which can be meat or fish, accompanied by a salad and crunchy vegetables. The specialty in Sardinia is porceddu, a suckling pig roasted with borche. Dessert: Sebadas are the most popular desserts. They are ravioli of puff pastry stuffed with ricotta and fried on which we add a trickle of honey. It’s just a treat! A digestive: the mirto is the most popular. Rates for a menu in agriturismo are fixed, usually between 25 and 30 € per person, including drinks (water + wine). And I assure you that for this price, the portions are very hearty and it’s hard enough to arrive at the end of the meal! And you, what are the places of interest that tempt you for your trip to Sardinia? Through BonAdvisor, I share my passion for travel since 2017. A hobby at first, I quickly realized that my articles could inspire travelers like you to better organize their trips. A question about a destination, a visit, a good plan? I'll answer in the comments.